Kids get to play with grown-up gear at CityLab. None of it seemed to work. But today in the Inland Northwest, a group of educators and scientists are dropping the stunts and hijinx for something they say works much better: bringing kids into actual labs for real scientific research. And as Spokane continues its transformation into a regional health care hub, they say nothing could be more important. CityLab — which brings middle and high school age kids into a laboratory setting to learn about biology, chemistry and biotechnology — was co-founded by Oliver and high school teacher Howard Waterman in 1995. Oliver estimates she reaches about 700 students a year. One of the first seminars CityLab offered was a science camp for young women. “At the time, there was great concern about young women’s interest in science,” Oliver says. Different topics of the weeklong camp have included the science of the natural world, a CSI-like program and learning about famous women in science. This June, the camp will explore the work and tools of health care professionals, and the girls will learn about nursing, pharmacy and medical technology. By the end of the week, the girls will have knowledge of DNA, will be able to identify different forms of bacteria and will have worked with a high-tech “dummy” that simulates heart rate, blood pressure and carbon dioxide levels. Training the next generation of health care professionals is integral to Spokane’s success, Oliver says. With the seeming inevitability of a full medical school here, as well as dozens of programs in local community colleges and the millions of dollars in research, Spokane needs a myriad of skilled health workers. “It’s all about creating teachable moments, which is the hardest thing to do,” Oliver says. Creating teachers that can make good scientists is something President Obama has already made a priority. Staub and some of her students are also conducting the Gonzaga Indian Education Outreach Program (GIEOP), in which they’re helping students in Wellpinit on some science fair projects. And some other students are developing a program with the alternative Havermale High School. They’re combining data on diseases from the health district with GIS mapping, and overlaying that with socio-economic information. “They’ll ask themselves, ‘I live in an area where there’s a high risk of obesity. Why is that?’ They’ll see a correlation between communities and health and they can do something for themselves,” Staub says. “It’s easy for kids to say, ‘I don’t like science. It’s too hard, too abstract, you can’t see it.’ But you can. You can see it right before you,” says Hank Mendoza, a science teacher at Shadle Park High School who is involved with CityLab. Mendoza tells a story about two young men he worked with years ago. They boys were working on a plasmid in a certain bacteria, and their research was funded by a biotechnology in education grant he and Oliver had secured. “They said, ‘Wow. This is real science. This isn’t cookbook. If you mess things up you have to do things over,’” Mendoza says. “And I said, ‘Yeah. It’s not sitting at a desk and working on papers. This is it, real lab work.’” Those boys are now men in college and both are studying biotechnology, Mendoza says. 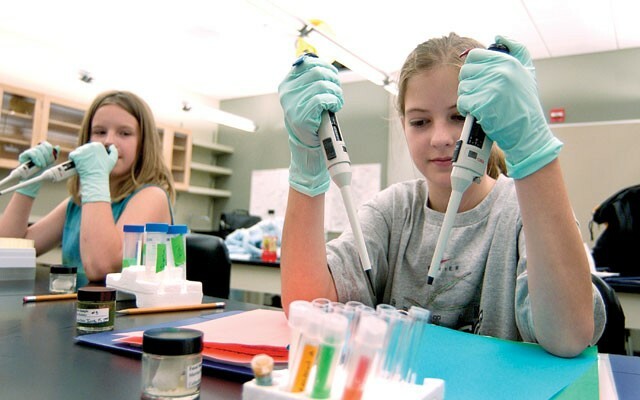 The Young Women’s Summer Science Camp is June 21-25. Call Sylvia Oliver at 358-7635.